If you are having difficulty getting comfortable on your bicycle, or have limited power output, and have run out of conventional solutions, there are a few options you may not be aware of. Many of the common comfort and performance issues are related to dissonant muscle tension, that is to say, muscular activity that is in some way contrary to propulsion. Usually, dissonant/parasitic tension is the result of the athlete’s unconscious need to stabilize the joints under load, or to protect those joints from damage due to harmful articulations while under load. These two combine with the need of the rider to remain in a state of ‘balance’. Evaluation of each parameter is difficult, and is still more of an art than science, simply because there are so many variables to contend with. There are, however, generalizations that can be made which seem to hold true. A good place to start is with a little reflection and self diagnosis. Has your athletic progress stalled? Is your average heart rate higher than you think it should be for a given workload? Discomfort (far beyond proportional fatigue) on long rides and under high outputs? Tight or sore muscles that remain that way regardless of conditioning? Muscle tension that does not seem to be directly related to the activity? 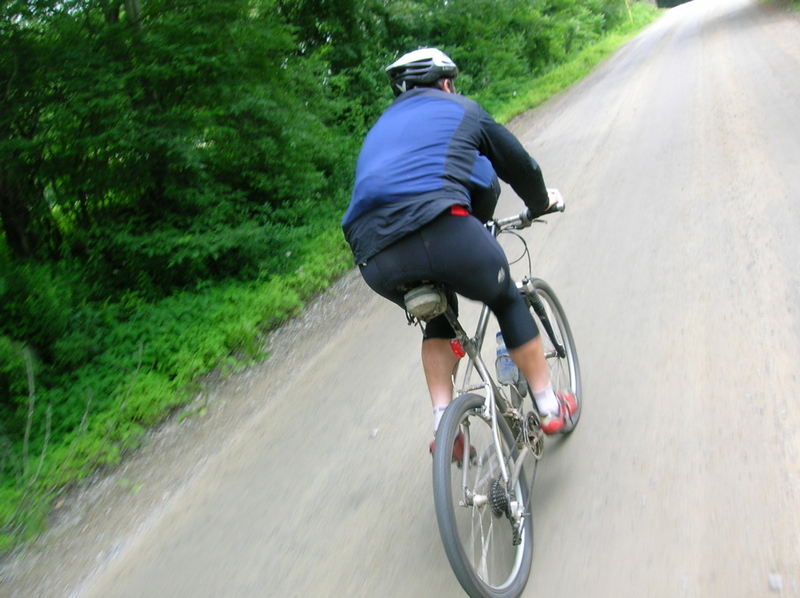 (E.G, on a long climb, do the muscles at the back of the thigh burn out much sooner than those at the front)? First, the shoes should fit, both in length, and in overall contour. A narrow foot in a wide shoe is a bad idea. As the shoe is a link in the transfer of energy from your body to the wheels, it should fit as snug as possible without discomfort or slop. Regardless of price, always take the time to try on the shoes made in Italy. Once you have found an appropriate shoe, support the foot. A custom footbed made of a hard, semiflexible plastic will be the foundation of power transfer. Any product custom molded to the contour of your foot will likely improve contact, and comfort. Once the contour of your foot has been matched, you can then match that contour to the inside of the shoe to eliminate hot spots and ensure that no movement is lost. Most feet are mobile to the arch side, and once this mobility has been accounted for, more of the movement from the extension of the leg goes towards driving the cranks rather than deflecting the bones of the foot. A solid footbed gives you something that you can attach foam or layers of tape to in order to stack your bones more effectively. (The white foam attached in the photo to the right is to account for half of a known leg length difference. The other half is under the cleat). Strangely enough, it may feel better to add material to the ‘wrong’ side of the footbed in order to align the bones most effectively. This is where some of the art comes in. The idea here is to locate the cleat in a place where there is the least amount of muscle activity used to support the foot on the pedal spindle while the spindle is moving. The structure of the foot will take load at the heelbone, and at the metatarsal heads. In other words, the ball of the foot. The first metatarsal bone, the one supporting the big toe, is larger than the rest and thus serves as the baseline. Locate the interspace between the distal end of the first metatarsal bone and the proximal end of the first phalange. Mark this gap with a pen. If you run your fingernail into the interspace and trace its outline, you can roughly determine the radius of the metatarsal head. Approximate the center of curvature and make a second mark. 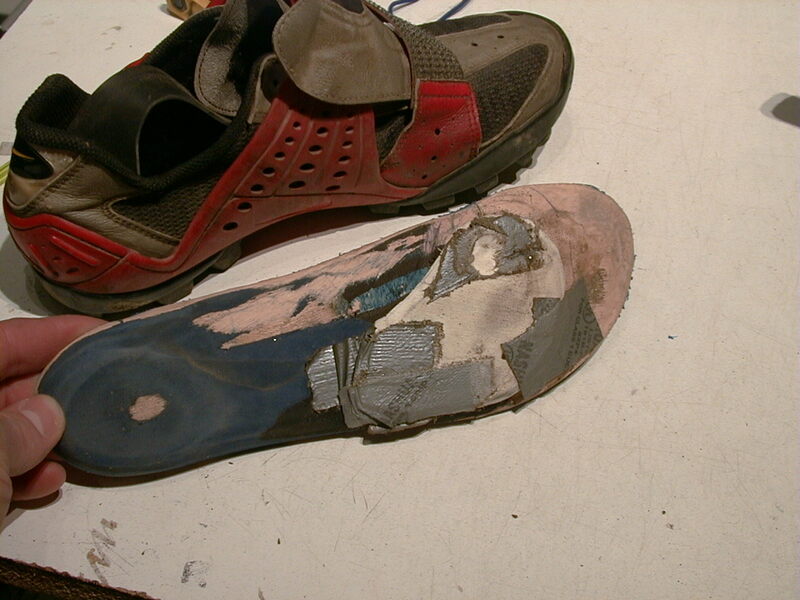 Transfer these two marks to the outside of the shoe, vertically with the heel of the shoe slightly elevated. 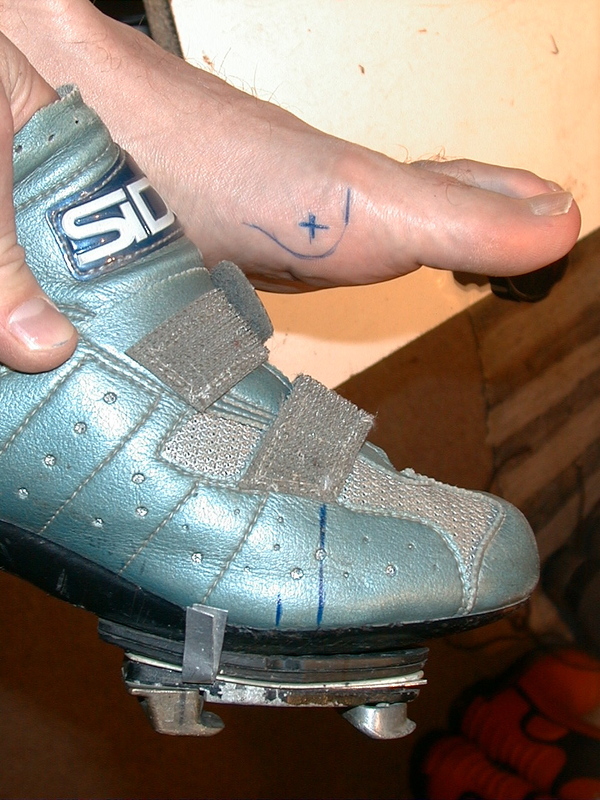 The center of the first metatarsal head is the baseline location for the spindle of the pedal. Attach the cleat to establish this relationship. (notice the spacers between the shoe and cleat, used to adjust for leg length difference). 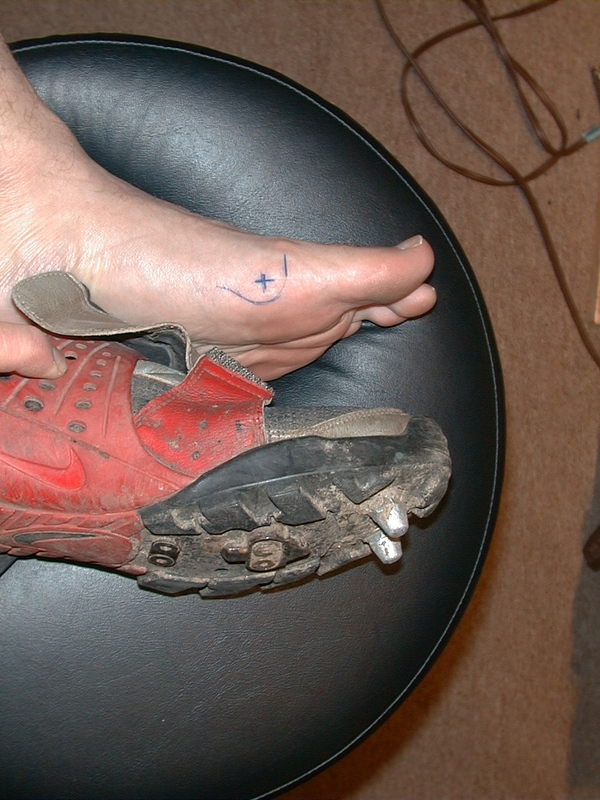 If the cleat is located too far forward (toward the toes), the muscles of the calf will quickly fatigue. Tension will usually be more noticeable below the curve of the calf mucles. If the cleat is located too far back, tension will usually develop above the curve of the calf muscle, extending behind the knee and into the bottom end of the hamstring area. This area will become tight to prevent the improper rotation of the foot over the pedal. 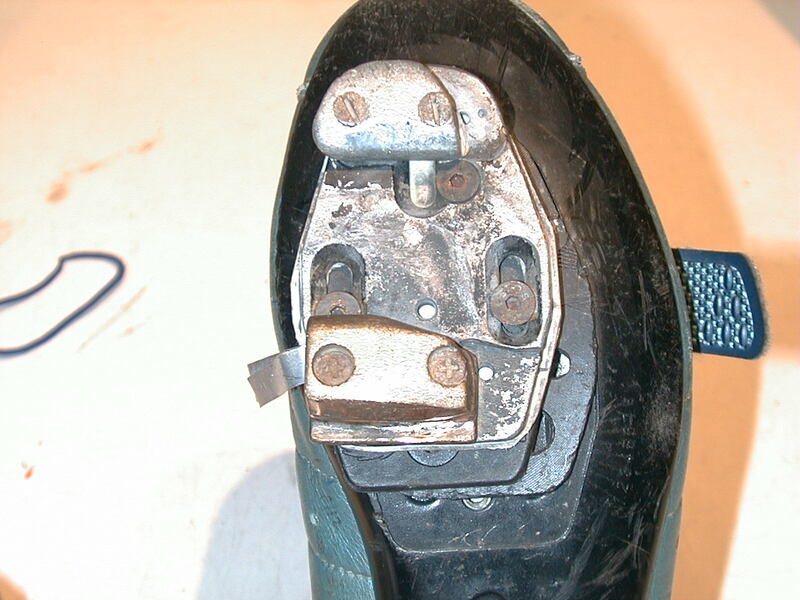 In other words, to prevent the heel from rotating up and over the pedal at the top of the stroke. The tension produced at the back of the leg will pull on the pelvis, rotating it back, curving the back, shortening the reach to the handlebars, and leading to a sore neck, and a sore crotch, among other things. This tendency to affect different muscle groups is a good reason not to try to accommodate a leg length difference via cleat placement. You can do it, you just might not like the results in the long term. If you have a long arch and short toes (as I do) or a short arch and long toes, you may find there is not sufficient adjustment provided by the original cleat track. 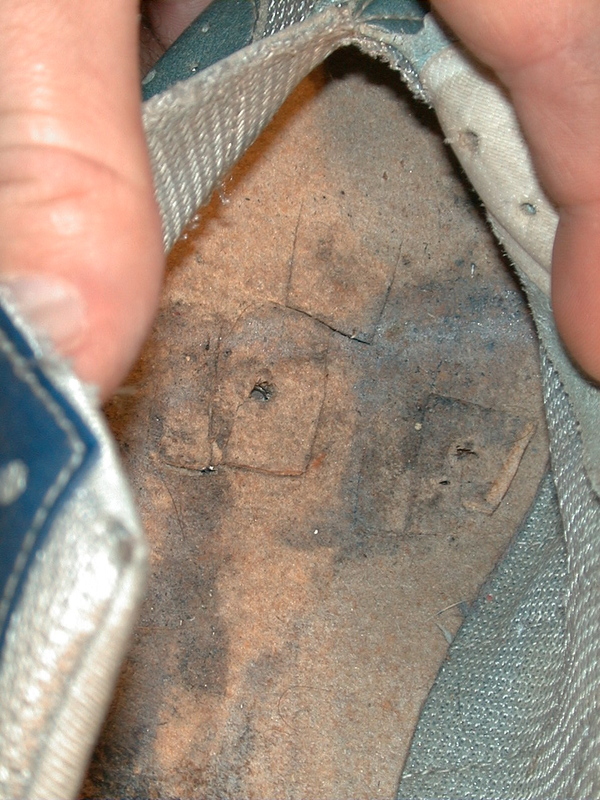 On a quality shoe it is often possible to expose the t-nuts in the sole from the inside and relocate them. Not a job for a beginner, but possible nonetheless. When evaluating cleat location, it is beneficial to spend some time riding on easy terrain out of the saddle. If there are geometric kinks in the pedal stroke, they will show up here. If the general tension in the back of the leg has been relieved, you can assume that fore/aft placement of the cleat is probably appropriate. 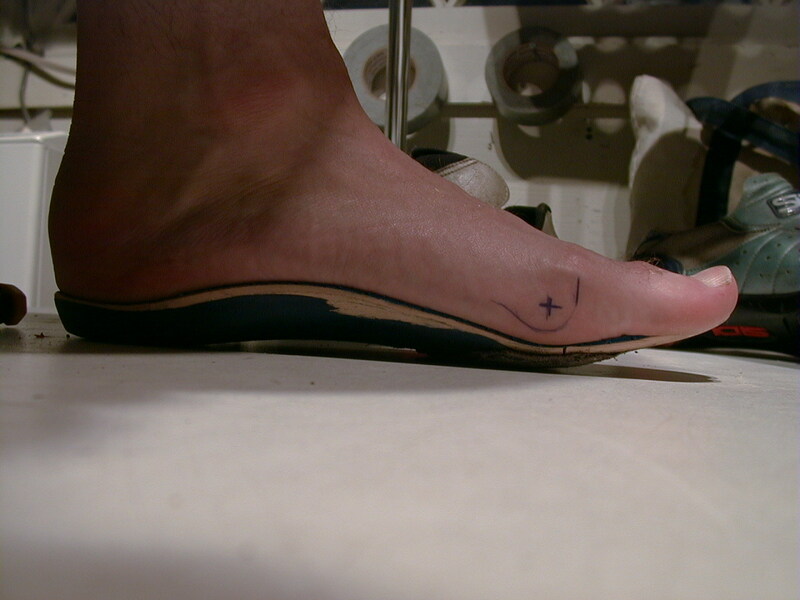 If tension on the inside or outside of the back of the leg exists, it may be necessary either to tune the footbed, or tilt the sole of the shoe relative to the surface of the pedal. In working with the footbed, add material to one side or the other based on what seems to feel more solid and comfortable. If you experience a growing discomfort or tension in the foot after a few miles, the posting(support material) is either on the wrong side or there is too much of it. Try to develop a sense of what changes seem to make an improvement, and which changes do not. You are looking for a net gain. If it hurts, it is not correct! If a muscle group fatigues in a progressive manner proportional to effort, try to determine if your actual output has improved as a result of the alignment change. If a muscle can be more fully utilized for propulsion, the odds are good you may push it a little harder. (It is possible that supporting the foot in full or part has made another issue more apparent. It is often necessary to revisit some of the adjustments for fine tuning. It helps to think of it as a closing spiral moving towards the theoretical ideal). If you experience a positive change through manipulation of footbed posting, but suspect that all is not right just yet, you may now need to tilt the sole of the shoe. When tilting the cleat on the sole of the shoe, you are looking for a smoother, looser pedal stroke with very little muscle tension in the back of the lower leg while standing spinning an easy gear. If your knees follow eccentric or elliptical paths through the pedal stroke, and/or spinning while out of the saddle causes premature fatigue or discomfort, tilting the sole of the shoe may affect this situation to the positive. On the other hand, the path your knees follow may be perfectly appropriate for your body. My left tracks straighter than my right, and my left leg is the one that makes me feel like some sort of a mutant. In the photo, the white plate and the black plate closest to the sole are angled. Again, if you tilt the shoe in the wrong direction or simply too much, power output will suffer and you may experience discomfort in the knees and ankles, more so while seated. Trust your body and do not persist in an activity that hurts! If pedaling is now easier, but you have to rock the bike excessively on each stroke to feel like you are getting power to the pedal, it is possible that your stance is too narrow. 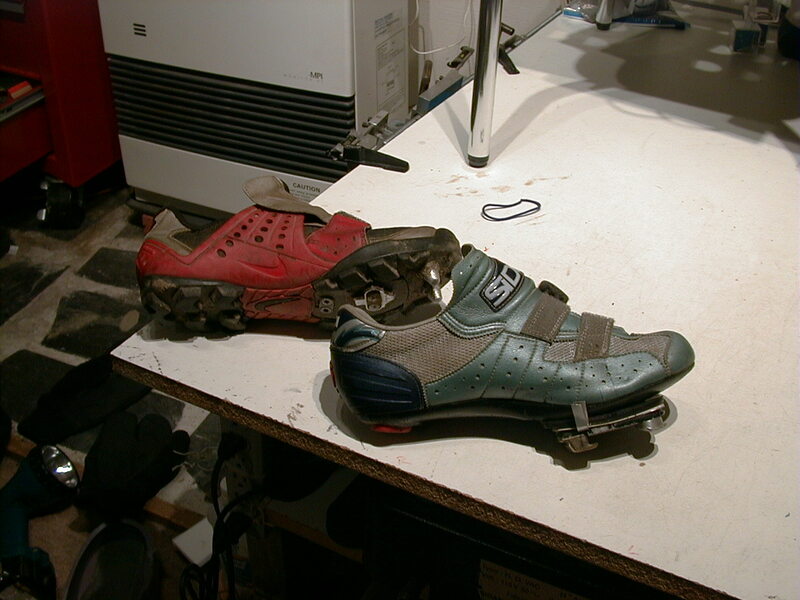 On most mountain bike pedals, there is some provision for lateral movement of the cleat. 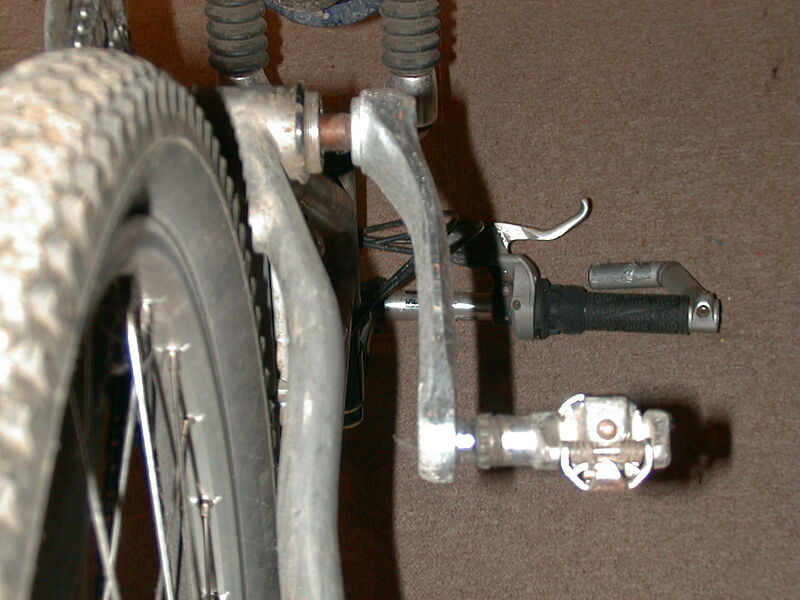 In some cases, the lateral movement is provided by the pedal itself. If you need more stance width, there is often enough room on the sole to move the cleat sideways as well as fore/aft. 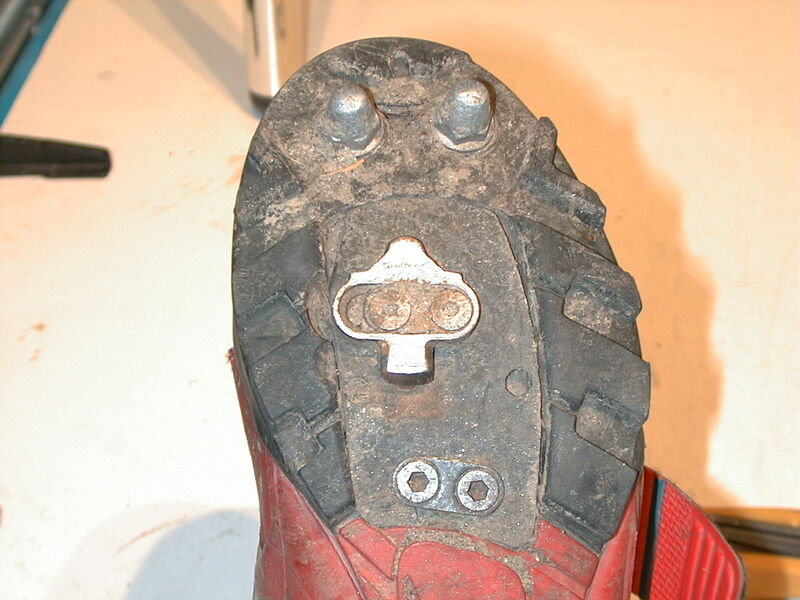 If your chosen system uses an intermediary plate between the actual cleat and the shoe, you may be able to get a little more adjustment there as well. If not, you may need to get tricky with the bottom bracket and crank selection. I need to offset my left foot further from the midline of the bicycle frame than my right. This is fortunate in that I do not have to mess with the chainline. My solution is to use large offset cranks with a longer bottom bracket spindle, and to fix it offset to the left in the bb shell. In order to accomplish this, I first machine the lip off of the fixed cup side of the bottom bracket. Then I knock the fixed cup side off of the bb, and press it onto the opposite side, as one side of the taper is usually longer to allow for the width of the chainrings. Thread the bb into the shell until the chainrings line up properly with the cogs. Wind in the other bb cup, tighten, and secure with a lock ring for good measure. 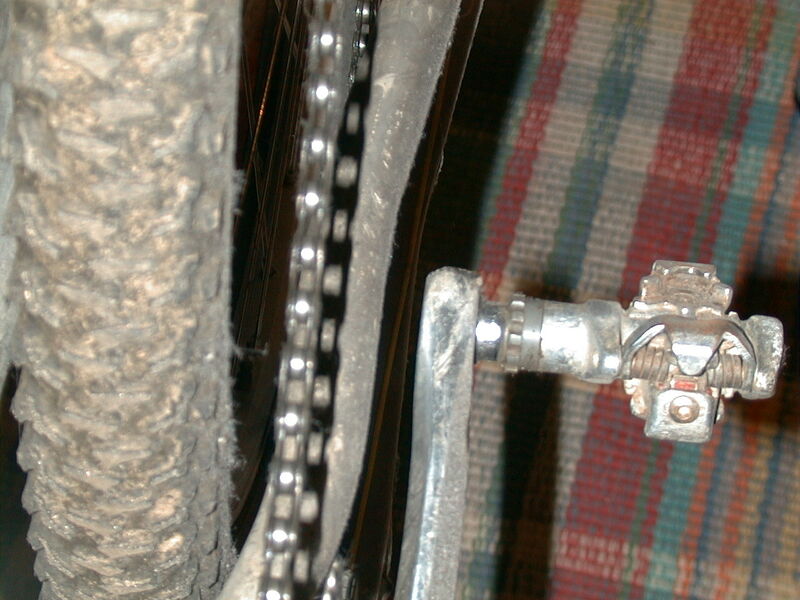 From the photos, you will notice that the left crank arm is much further from the frame than the right. If, after all of this hullabaloo, riding standing is much smoother and feels more solid, then you may assume that your efforts so far have not been in vain. If riding seated still generates tension at the back of the legs, and the spin does not feel as smooth as when standing (like riding biopace chainrings), you may have one leg longer than the other. Saddle height usually defaults to whatever is most comfortable. If one leg cannot reach the bottom of the pedal stroke, and the other cannot extend fully, tension will result. The problem is that is difficult to determine which leg is shorter. Take a guess, shim one side by 1/8 of an inch inside the shoe, and then take a ride. You should feel something. If it feels better, add another shim and try again. 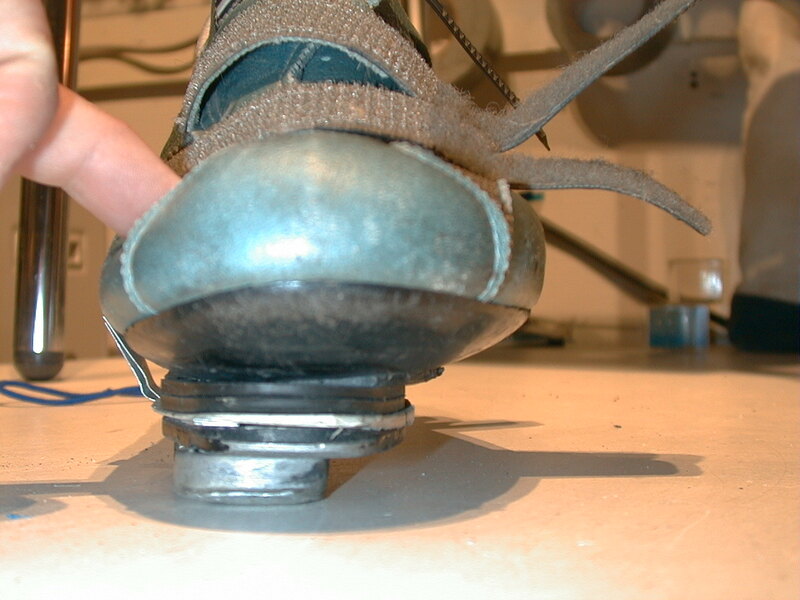 If you think that you need more shim than will fit inside the shoe, add a spacer between the shoe and cleat and then add again inside the shoe. (see photos). Just for kicks, switch the shims to the other side to see if it really feels unpleasant over there. When you think you are getting close, you can use layers of thick duct tape. Nashua 357 is a good product for this purpose. Once you have come close to sorting out the leg length thing, you may find that the saddle height can be increased, and a gain in usable leg extension may be realized.